24 piece carrying case provides a beautiful and protected environment for your LookingGlass® sculptures. Product Details: 7.25" Wide 9" Tall Nylon Collector Case Holds 24 Pieces LookingGlass® figures not included. 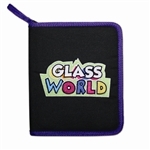 Please note that this Collector Case holds ONLY LookingGlass® protective cases which are round, not Glass World® protective cases which are square. 18 piece carrying case provides a beautiful and protected environment for your Glass World® sculptures. Product Details: 7.25" Wide 9" Tall Nylon Collector Case Holds 18 Pieces Glass World® figures not included. 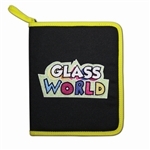 Please note that this Collector Case holds ONLY Glass World® protective cases which are square, not LookingGlass® protective cases which are round.